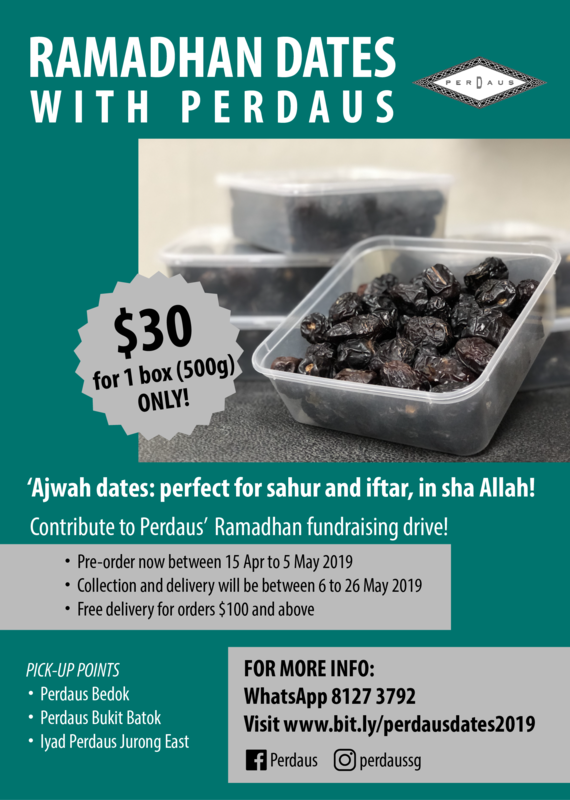 Pre-order Your 'Ajwah Dates for Ramadhan! $30 per 500g a box! Do you know that Rasulullah SAW has mentioned 'ajwah dates several times before? Hence, consuming 'ajwah dates could be considered as a Sunnah. 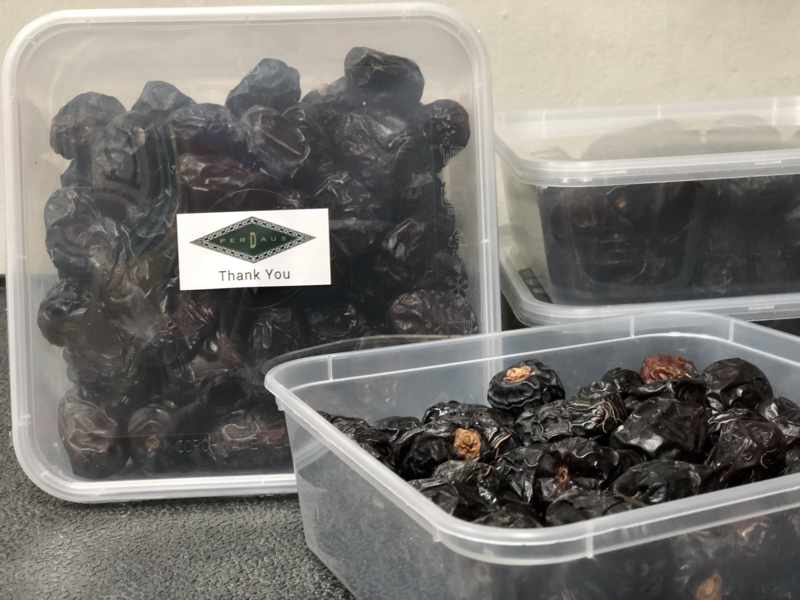 Alhamdulillah for the ease in procuring 'ajwah dates in this day and age! The Ramadhan moon is coming, and what better way to prepare for fasting AND to break your fast with dates! Dates are an excellent, power-packed food that helps you sustain your energy throughout your fast due to its low Glycemic Index (GI). As for breaking your fast with dates, this is also a tradition of Rasulullah SAW! We invite you to take this opportunity to practice a sunnah (or several!) and contribute to charity at the same time, in preparation for the blessed month of Ramadhan! We provide free delivery for orders above $100 only. Please transfer to DBS Autosave/Current Account: 017-014371-9. For online transfers, please type in your name under the "Initials". For both modes, please screenshot or take a photo of your receipt (for ATM), and send it to 8127 3792 with your name attached. For any queries, please call or text our finance department at 8127 3792. Perdaus - being a voluntary welfare organisation - our main source of revenue is from the fees from our programmes and the occasional generous donation from individuals. We seek your generosity for the success of this fundraising drive to ensure that we will be able to carry on our mission in nurturing future leaders in the community. Your contribution will allow children from low-income families to continue enjoying their education in Perdaus, while assisting our organisation with maintaining operation costs that are ever-increasing. Do share and spread this news around with your family members and friends, by referring them to our Facebook page at fb.com/perdaus.org. Your generous contributions to this drive will be felt by all, whose lives we touch in Perdaus, both young and old, from our various programmes and community work. We look forward to a long and rewarding relationship with you in the years ahead. If opting for home delivery only. For parent of Perdaus - if applicable. How did you know about Ramadhan Dates with Perdaus? For those opting for pick-up. For those opting for delivery. Please give an approximate time. If using online banking for fund transfer. This is important to smoothen the backend procedure.